Barnes & Noble has long been promising to expand internationally, but aside from a Nook Store in the UK that promise has only been a promise. That changed today. 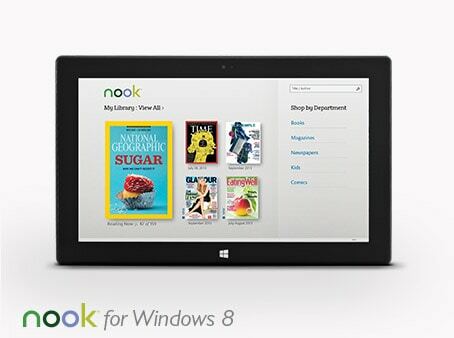 B&N has rolled out a new version of the Nook app for Windows 8, and along with the app they are opening up new branches of the Nook Store. Readers in 32 countries (Australia, Canada, the US, and 29 European countries) can now buy ebooks, digital comics, magazines, and newspapers from B&N. Assuming they have a Windows 8 PC, that is. The Nook Store is not mentioned as being available internationally via B&N's other apps, and there is no news today about an international launch of the Nook hardware. B&N had recently launched an updated Nook Glow and delayed plans for a new tablet, but they have not shared any info on possible retail partners to go along with the expanded Nook Store. This could be a sign that the international effort is less a B&N program and more the work of Microsoft. Microsoft does own a chunk of Nook Media, B&N's ebook sub, and B&N has said that their international plans would go forward under the auspices of their partner. At last report B&N planned to expand the Nook Store into 10 countries by the end of the year. I think they met that goal. On a related note, the Nook app for Windows 8 has been updated a few times in the past 9 months or so, which is more than can be said for the Nook apps and NookStudy apps for Windows 7 and OSX. The Nook Store was even set up so the number of supported languages could be readily expanded. You can find more details here. Of course, just because the Nook Store is available in a country doesn't mean that the selection is any good. The newly expanded Nook Store still only offers a limited selection in some languages; for example there are fewer than 600 titles in Polish, and another 600 in Finnish. And while there are around 40 thousand titles in German, the Italian language catalog is limited to only 19,000 titles. The Nook Store is facing stiff competition in much of Europe, with Amazon, Kobo, Google, and Apple all operating ebookstores or planning to open ebookstores in many countries. And then there's the local competition, and the white label ebookstores supported by OverDrive and txtr. Still, this is a good start for B&N/Nook Media, and it finally moves them out of being a US-centric content store. I expect/hope that the new B&N website that will be launched in April next year will also support these new countries . Hopefully at that time the Nook devices and other Nook apps will also become available in more countries. Best Buy has pre-thanksgiving sale , yesterday thru wednesday of the Nook Simple Touch with glowlight, for $49.99 . It is last year’s model, so I’m not sure it’s worth getting. It definitely looks like a Microsoft thing and not a B&N thing. Windows 8 PCs and Tablets only (presumably smartphones too but it doesn’t say that). I believe this means you can’t actually open an account from Canada and purchase anything unless you are Windows 8 PC/tablet equipped. It seems nonsensical to acquire the rights to sell merchandise in 32 different territories around the world and then not allow most people to buy them. If this is mostly a Microsoft initiative, then you should remember that Microsoft aren’t really interested in selling books. They are interested in selling Windows 8, and this is just another way to encourage people to switch to Windows 8. I suspect that a Mac, iOS (or even Windows 7) app will never arrive. Microsoft’s interest in ebooks is similar to that of Apple, Samsung, or Sony. Like you said, ebooks are a secondary interest, not primary.